Beavers are keystone species in ecosystems because they create species-rich ponds, water purification, and conservation flood plains and flood management. By creating the pooling of ecological assets, relationships and energy, they provide a unique niche of value to the thrivancy of living systems. Using this metaphor, we can add the idea of network beavers to network weavers as key to network building. Network weavers connect people in new collaborations. Network beavers create gatherings that pool network assets, relationships, and energy in a space of dynamic and complex adaptive interaction. These can be formal and informal, very small to large scale gatherings. In many cases, they feature the sharing of ideas and collaboration, resources, celebration, and learning. Just bringing a variety of people together with their variety of assets, aspirations and affiliations creates rich dynamic poolings of possibilities. New conversations converge existing idea flows into new swirlings of connection and rich flood plains of possibilities. The work of network beaver is simply to create the space and the invitations. There is nothing more or less involved. As a result the network ecosystem grows and thrives. I’m doing some network coaching with a small group of network weavers and thought I would share with you some coaching frameworks and practices that help people quickly adopt and adapt network approaches. Especially with a new domain such as network weaving, people may need some training to learn about network concepts and practices before they can apply them. However, I’ve learned that the smaller the training unit (5-15 minutes max), the more likely it is that people will be able to apply the learning. Part of the training needs to be a quick activity to try out the practice in the training session. If you’re talking about ways to create network maps, have the individual or small group develop a map for a project. The final part of training is for the participants to identify an action step they commit to undertaking before the next session. What happens when people try something out becomes the content of the coaching. The next step is creation of peer support. On occasion people will need individual coaching, but this is expensive and doesn’t make use of one of the benefits of networks -- access to the intelligence of others! There are many models of peer support groups. One I’ve been exploring is Authenticity Circles (http://www.authenticityconsulting.com/act-lrn/a-l/process.htm) developed by Carter McNamara. Peer support groups can be virtual or face-to-face. However, I’ve found that it is good for people to meet face-to-face for the first session, if possible, and have a chance to get to know each other as people (their likes, dislikes, interests, passions, family, etc). If this is not possible, I find it useful to use a platform where people can see each others’ faces (Skype Premium or www.anymeeting.com). It’s useful to set up a block of sessions (once a month for six months) and then at the end of this period determine whether the group wants to continue. If often helps, especially for groups where people are not familiar with peer support, to have a facilitator who moves the process along. This facilitator might also be the one who sets up the times for the sessions and sends out reminders. · What about this challenge has surprised you? · If you did this over again, how might you do it differently? · Have you ever experienced anything like this before? How did you deal with that situation? · Is there anyone in your project network who could be a support to you in this? · What would be good to clarify before you move forward? · What are a number of options for your next steps? · What are your thoughts about a possible next step? Why that step? · What are some resources you might explore? · What assumptions were you making? Have they been challenged? · What would success look like to you? What has been your experience in setting up peer support groups? Have you applied that to helping people apply network weaving? Networks of people are all around us. They are the most ubiquitous dimensions of communities and organizations, economies and affiliations. Networks are boundaryless patterns of connections between and among people. They cross geographical, digital, demographic, ideological, economic, social, and ideological boundaries. Networks intersect and overlap. Everyone on the planet is a member of at least one network and all networks are ultimately connected. Everyone in a network has three circles of connections. In their first circle are people we are closest to. Second circle people are people we know more casually. Third circle people are people we don’t even know exist, but are two steps from us through our first and second circle people. We can measure growth in networks in several important ways. How many active network weavers are engaged in networks. The pivotal indicator is the scope of network weaver engagement in networks. The other four indicators are accelerated by the work of network weavers who instigate, facilitate, and enrich connections in networks. As these indicators increase, the quality and impact of the network grows in ways that benefit the individual members of the network and the network as a dynamic whole. The evidence indicates that people have measurably better health, work, well-being, optimism, and engagement in their life when they are connected to happier networks. We can build on these indicators by adding happiness indicators to the mix. We start with the five prime happiness practices that become principles for the articulation of network growth indicators: appreciation, generosity, interest, lightness, and easy. Here are just a few of many possible measurable happiness indicators in networks. When we consider the connection rather than the individual as the fundamental unit of networks, we can begin to talk about creating happier connections where these indicators are evident in intention and expression throughout networks. They become principles shaping the critical contributions of network weavers. As we now know from the research, when connections are happier, people in these connections are more naturally productive, generous, creative, courageous, realistic, passionate, resilient, and healthier. As it turns out, these are also the qualities of strong and growing networks. The whole thrivancy of networks grows when more people become connected to already happier connections and bring more happiness to the connections they have. This is how happiness scales organically through networks. This is how we move from thinking about growth just in quantities, densities, and reaches of connections to the vibrant and contagious quality of connections that add to the measurable well-being of the network. Stories like those from the Arab Spring featuring Egypt's remarkable transformation points to the unprecedented shifts in the landscape of influence. These are stories of grassroots networks imploding old power structures made irrelevant by their isolation. The lessons here are that when self-organizing networks get stronger, old autocratic power structures weaken because, as the data suggests, they only have power to the degree they keep networks divided. Influence networks were the incubators of Civil Rights, the Berlin Wall, Ireland, South Africa, and Egypt. Each is a story of small scale core groups of connected people with a compelling message and indefatigable passion grew influence in networks that transformed the landscape of power and possibility. When we build and connect influence networks, people become more aligned and less easily weakened by division. The impossible becomes possible when people are connected in their dreams and gifts, connections and actions. The social network sciences have become a rich and amazing source of data based validation and hope for social networks. We can intentionally and strategically grow them. And to the degree that we don't have formal power and cannot buy relationships to formal power, we grow our influence at the rate we grow our networks. In the new world of networks, influence can be grown more sustainably than it can be purchased. The business case for growing influence networks using the principles of the social network sciences is clear and compelling. The principles work whether we are striving to influence choices, habits, votes, opinions, proposals, or adapting to change. Start with the fact that people are influenced by people with whom they have resonance and trust. Resonance is feeling like we have something in common. Resonance builds through the sharing of stories that connect us. Trust is having a relationship of reciprocity with someone. Contrary to media and marketing deceptions, people aren't influenced by spam media, the seduction of ads, hype, charts and spreadsheets, or the allure of popular opinion. They "catch" the perspectives of people like them and people they like. They're influenced through their connections. People buy and believe what their resonant and trust significant others buy and believe. It's been this way for a very long time and the legacy of this dynamic appears to have a bright future. In every network, everyone has some quality of influence on other people. Influence potential is a function of three variables: visibility, credibility, and currencies. Visibility is how many other influencers someone knows and how many know them. Credibility is how well someone is known for being resonant and trustworthy in what they say and do. Currencies are the kinds of value someone has to offer others in the network. Value includes tangibles and intangibles like data, knowledge, expertise, questions, talents, access to resources, positional power, followers, allies, and incentives. Some people only have influence with their small circle of people. Some people have wider influence across different parts of the network. 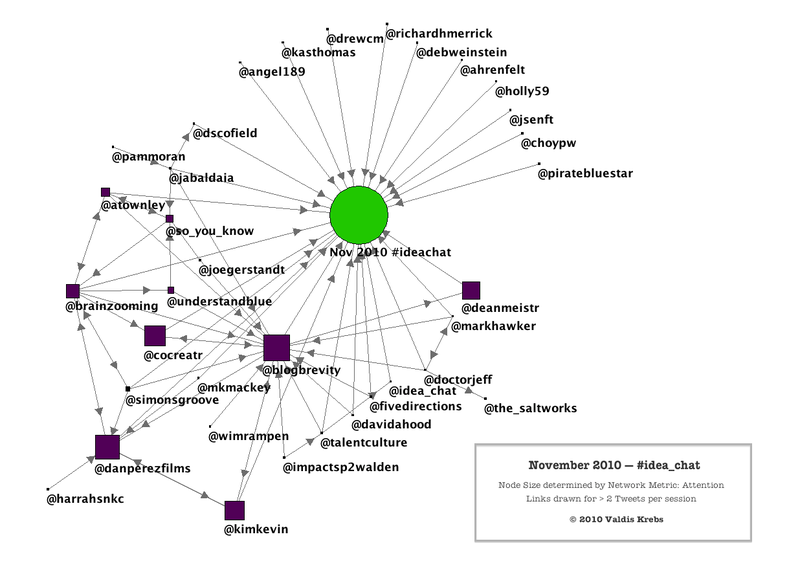 Some people have influence that spans across multiple networks. There are several basic ways we can build and grow influence networks. It starts with being clear on what we want people to know, feel, and do as the result of our influence. It's identifying who in the network has strong influence through visibility, credibility, and currencies. Then it's identifying which of these people have the highest receptivity. Influence receptivity is relative openness to learning or considering more than what one already has concluded. Someone is receptive when their mind isn't yet fully made up. The scope of our influence in a network is equal to the scope of people who haven't made up their minds relative to what we want to influence. Assessing receptivity can happen indirectly through talking to others who know the thinking of those we want to influence. It can also happen directly by asking those we want go influence whether they are still considering things in any way. If they still have unanswered questions, optimism for further options, or doubts about current dominant opinions, they are receptive to influence. We can help lower visibility people with good credibility and currencies become more visible. We can introduce them to more people, help them expand their virtual presence, get them more engaged in the network's collaborations. We can connect people with higher influence potential with other people with higher influence potential. We can do this through quality introductions and collaborations. We can help people become more engaged as connectors, connecting people of higher influence potentials. This means helping them learn how to notice opportunities, make quality introductions, and help people identify collaboration possibilities. Helping people increase their visibility, connectivity, and engagement is usually easier than help them increase the personal givens of credibility and currencies. When we help people become more visible, connected, and connectors, influence networks grow. No amount of threats or infusions of resources in networks can ever substitute for these strategies. No amount of top-down power brokering or power wielding can substitute for these strategies. When we use the principles of the social network sciences, we build influence in networks, we can scale and accelerate our learning and the possibilities of alignment. Our understanding of influence in communities and organizations is undergoing radical shifts thanks to the emergent wisdom from the social network sciences. We are also now seeing unprecedented shifts in influence landscapes on all levels around the world. The two key players in any scope of influence are the deciders and the influencers. Deciders are people who have the final vote or say over ultimate actions. Their power can be assumed, assigned, appointed, or appropriated in elections. In the case of civic elections, everyone with a vote and voice can be both a decider and influencer. Influencers are those who deciders listen to by choice or obligation. Influencers have the power to shape and challenge what deciders know, feel, and do. 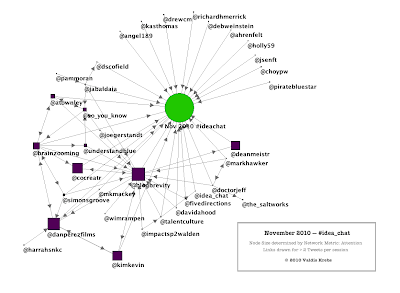 In influence networks, influencers also influence other actual and potential influencers. We can think of any decision as emerging from influence networks. Every decision has its own influence network. 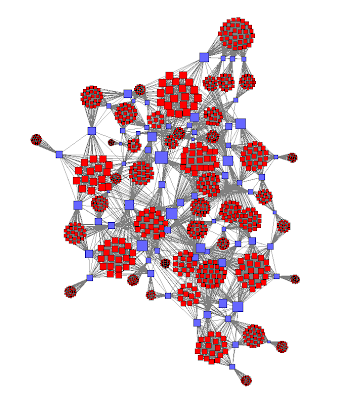 Some people are participants in multiple and ongoing influence networks as a function of their interests, passions, and formal and informal positions within networks. Their voice dampens, challenges, strengthens, and amplifies other voices in the network. There are always people in influence networks who may talk or write a lot but have little actual influence within the network. Their lack of influence is a function of their having inadequate visibility, credibility, network awareness or currencies of influence. The currencies of influence that give influencers their power include data, expertise, questions, resources, positional power, influential followers and allies, brand influence, bribes and threats. These currencies only have power to the degree that an influencer has sufficient visibility and credibility. The more visibility and credibility influencers have, the more power they have to shape what deciders know, feel, and do. The actual power that influencers have over deciders and other influencers in any context depends on several principles. There many actionable implications to these principles. If you want to have more influence with any deciders, find out which are still forming their conclusions and interact with them and those who directly and indirectly influence them. If you want to increase the potential power of your influence, so whatever you can to increase your influence network visibility, credibility, network awareness and influence currencies. Find out which exact currencies have the most power with deciders and influencers given the contexts of specific decisions and networks you're navigating. Don't assume the same currencies work across different contexts. If you want to support those who share your perspectives or positions, collaborate with them to create more shared and scaled visibility, credibility, network awareness and influence currencies. Spend more time amplifying your messages and contributions than trying to dampen those you oppose or question. The better you know your influence networks, the more easily you will effectively add influence that realizes your passions and engages your strengths. Seek to identify and influence receptive macro-influencers, people who have greater than average influence across key sectors of networks. Create more connectors in networks who can connect receptive potential influencers with strong visibility, strong credibility, strong currencies influencers. Strong networks have the characteristics of strong communities. People know and look out for each other, they learn and share with each other. In weak networks, people are isolated and fragmented in cliques. Whether a network is stronger or weaker has significant implications for the nature and place of crowd sourced engagement in governance. Even today with technologies that could support otherwise, democracies still practice representational governance. People indirectly influence policy makers through informal communications and demonstrations and formal hearings and voting. In any vote on any issue, there are four kinds of engagement in networks. There are the expert informed, the informed enough, the not informed enough, and the inaccurately informed. In network structure and culture, the not informed enough and inaccurately informed are the result of three factors: weak redundancies, small reach, and low resonance. Weak redundancies are when someone has only one or a few paths to accurate and complete information about the issue at hand. The more path redundancies created by more connections to information, the more accurately and completely informed someone is. Small reach is the dynamic of having a small scope of connections that do not make larger network awareness accessible. People in cliques do not know what people outside their cliques know because their scope of connections represents a tight circle. People with small network reach are most vulnerable to being not informed enough or inaccurately informed. Low resonance is low social credibility. Resonance is the ability to feel what someone else feels. It can take the form of identification, empathy, and compassion. Uninformed and inaccurately informed people may have connections to more informed others, but when they not resonate with them, they are not influenced by their information. Weak links in networks are links of weak influence. Creating the most informed people possible when an issue is on the civic table then means three strategies of building redundancies, reach, and resonance. We can identify those in the network with the stronger network awareness, credibility, and capacity for connecting people. We can make sure they are many and strongly informed. We can facilitate more introductions within and across networks in formal and informal ways. And we can make sure these introductions are personal and build resonance through personal story sharing, which is the most significant factor in resonance. These strategies give people more access to complete and accurate information. They facilitate the emergence and attention to questions people have that enrich the conversation and shared learning, which is more important as issues become more wicked and complex. When networks become stronger, networks can even become capable of the kinds of conversations that make the divisive nature of voting less necessary. What if we invented an approach to democracy where voting was not a design element in the model? Voting continues to be the root cause of unchallenged excesses, bad decision making, unethical special interests, and leadership incompetence. In most cases, voting is an excuse to avoid conversations that are information-based, inclusive, and innovative. There is no wisdom in crowds of weak networks, only strong ones. Managing assets in the commons can happen in strong networks of people as long as the commons are at the scale of networks where the degrees of connection are relatively close. In these networks, people come together to create commons they manage through conversations that matter. A very different world indeed. One model of transition can be where people in regions vote on key principles that then shape local civic actions that emerge from richer networked dialogue. Civic leaders in this model who enact policy decisions become conveners, facilitators, and trustworthy interpreters of civic conversations. Everyone directly participates and contributes through formal, informal, and technology media. This results in crowd sourced alignments that are more wise, inclusive, and resilient. With stronger networks, we become smarter and better together. When we talk about building community, we start by acknowledging that many of us live in multiple communities. A community is a network of people who share things in common. We live in communities of place, past, purpose, perspective, and practice. Neighborhoods, villages, and regions are communities of place. We share common geographies, resources, issues, and possibilities. Families and ethnicities are communities of past. We share common heritages, languages, cultures, ancestors, and roots. Companies, organizations, and institutions are communities of purpose. We share common mission, vision, goals, commitments, and interests. Religious and spiritual traditions, political ideologies and worldviews are communities of perspective. We share common beliefs, stories, and values. Professional disciplines, crafts, and careers are communities of practice. We share common types of work, knowledge, and learning. Some of these communities overlap, some intersect, and some are separate and don't connect. We are naturally close to people who belong to the same multiple communities with us. We seek communities where we feel a tangible and visible sense of belonging, engagement, and possibilities for a meaningful life. The quantity, quality, and reach of our connections in any of these communities depends on how connected people are in each community and how much connecting we do with people in each community. Our life gets richer when we connect people across our communities. This starts with looking for where connections already exist and then being a bridge between people and groups within the communities in which we belong. Life is sometimes a journey of discovering and joining new communities. We move, change jobs or careers, change religious or political affiliations, shift in how we look at the world. Technology and the globalization of markets make us more mobile, agile, and curious. Building community can mean building one of these, multiples of these, and connections between them. In every case, we are inviting people into the conversations that optimize the possibilities of belonging, engagement, and making a difference. These are the dream conversations, the small acts and gifts conversations, and the invitation conversations. As communities grow, people are better able to know each other, look out for each other, share with each other, learn from each other, and engage each other in doing what they cannot do alone, apart, or in opposition. Our personal well-being is always related to how we together care for the well-being of the whole. What is the difference between movements, coalitions and networks and how does each relate to the others? Which one makes sense for what kind of situation? The term movement has been used for more than a century to describe the dynamic process by which broad moral issues bubble up and – when successful – change the way people think and act. The right of women to vote generated a powerful movement that not only led to the 20th Amendment but also succeeded in convincing virtually everyone that women were as capable as men of participating in the election process. Movements are about raising issues – bringing issues that have been hidden or underplayed into the public spotlight so that people not only become aware of the issue, but are moved to do something about it. Movements thus become a magnet for energy, and if they are effective, they create a sense of mass and pressure that influences policy and leads to transformation in beliefs and behaviors. Movements often operate very informally connected primarily through relationship networks: individuals or small groups of women throughout the United States organized marches and hunger strikes, wrote editorials and gave speeches, all to raise awareness of the issue. Although organizations were formed to work on the issue, the movement was much broader than the membership of those organizations, engaging women from all walks of life. Movements, however, tend to have strong viewpoints about what is right. They raise moral flags. This is useful for exerting pressure but long-term success of a movement depends on the ability of the movement to persuade people to a particular viewpoint and the openness of people to be persuaded. In the last few decades movements have become increasingly limited in their capacity to spread throughout society by the highly polarized political scene in the United States: few movements have been able to escape the label of either belonging to the left or the right. So rather than changing the discussion or bringing up a new discussion, movements have been increasingly forced into current discussions of left and right. Few on the left would take seriously any movement labeled as conservative, while those on the right would dismiss any movement emanating from the left. Some questions this raises are: can movements escape the narrowness of right and left? Can we frame issues differently so that they are more likely to become universal? Advocacy networks or movement networks are the operational part of movements. They consist of the relationships among individuals and organizations that are making the movement happen. What is interesting is that until recently, most advocacy networks were not formally organized. In fact, this was a strength in campaigns such as the one supporting women’s right to vote, where different types of organizations had quite different approaches to the issue and played different roles: the Suffragettes were radicals pushing the front edge of the movement with hunger strikes and even violence while the Women’s Christian Temperance Union appealed to a more moderate audience. The organizations were linked through key bridging individuals, such as members of the International Council of Women who promoted communication among efforts in different countries through speaking tours. As a result, individuals in the movement influenced and supported each other, even though their beliefs and approaches differed. The later part of the 20th century was characterized by many transnational advocacy networks – most informally organized – which held funder-sponsored convenings (such as those on ending violence against women) where priorities and strategies were developed. Sets of organizations (often from one country or region) then determined which specific actions were most appropriate for their locale and implemented those. It’s only in the last decade or two that advocacy networks such as those involved in healthcare reform have begun to organize more formally. The formation of coalitions and alliances are examples of this type of more formal intentional network. Coalitions are generally tightly defined advocacy networks with explicit membership that form around a specific policy initiative. Because everyone in a coalition needs to agree on a clearly defined set of objectives and because of the specificity of the objectives, coalitions tend to be short-term. One example of a long-term coalition is the Massachusetts Smart Growth Coalition. One reason it is able to continue as a long-term network is that the coalition has only 7 members, and key players from these organizations have known each other for many years. In addition, this group has the resources to spend a lot of time developing its action plan together and has access to the services of a full-time coordinator. A more typical coalition is Healthcare for America Now (HCAN) Health Care for America Now (HCAN) is a national grassroots campaign of more than 1,000 organizations in 46 states representing 30 million people dedicated to winning quality, affordable health care. In 2008, a core group of national organizations developed a set of principles to guide the formation of the coalition. Partners were actively involved in developing (and adapting) strategic plans and worked together to implement these plans. They had a strong engagement and communication system, especially on the national level. HCAN built strong state networks in many states, and these partner organizations were able to mobilize their memberships to scale the campaign very rapidly and increase influence on congressional districts. Local stories and feedback from specific efforts also improved the national campaign. The network structure underlying HCAN enabled it to adapt quickly to changing circumstances. Manuel Pastor et al, in Connecting at the Crossroads , defines alliances as long- term networks of grassroots groups to build power to bring about change. An example is Partnership for Working Families, an alliance of 12 local organizations and the California Alliance, a set of organizations reforming the tax system. 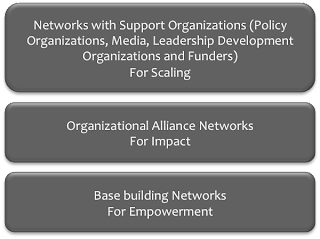 These networks bring people together for strategic dialogs, relationship building, and joint action and campaigns. The fundamental task of an alliance is to connect groups that have stood apart. 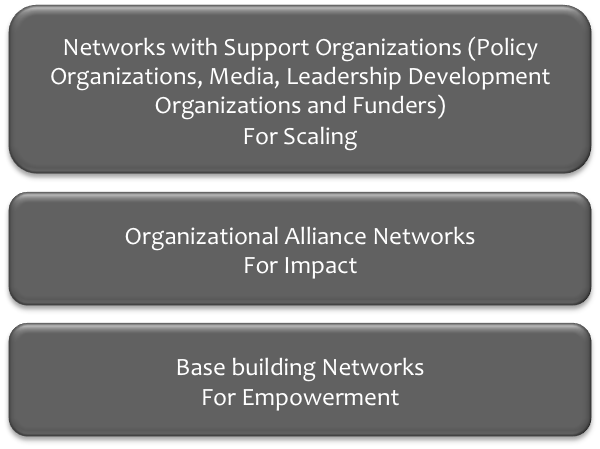 To be most effective, networks need to include base-building networks that engage grassroots and neighborhood constituents; organizational alliances among organizations that usually don’t interact; and networks with funders, policy, media and leadership development organizations to enable efforts to expand and scale. Advocacy and alliance networks tend to focus on raising issues and changing policy. Other networks focus much more on developing a new system. For example, the many local food system networks support local farmers growing food for local markets and have created farmers markets and community support agriculture (CSAs) to provide new local marketing channels. Local food activists have set up kitchen incubators – local processing facilities where entrepreneurs can make processed products and community gardens. Local tourism bureaus have created efforts such as the 30-mile meal (see http://30milemeal.wordpress.com ) so that consumers change their behavior and begin purchasing more local foods and restaurants highlight local foods. Of course, most local food efforts include policy efforts – many communities now have local food policy councils. And, most local food networks are linked with other local networks around the country through organizations such as BALLE and Slow Food. In system development networks, subsets of the network create new system elements such as bike-sharing programs and solar retrofit projects in climate change networks or blood pressure clinics and mobile health units in health networks. Such networks are most successful when regional or local networks encourage small self-organizing groups to implement opportunity-driven project,s which are linked together through a strong relationship network. When regional projects are linked nationally through learning networks and connections with other innovators, their impact is often accelerated. 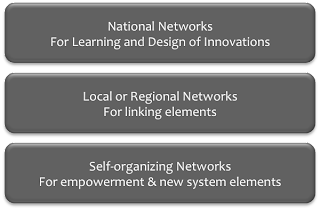 An example of a system development network is the Regional Flavor Strategies Network. Regional Flavor Strategies was a national learning network of 6 regional networks implementing a strategy to encourage local businesses to work with tourism, arts organizations, universities and other partners to develop the unique qualities (regional flavor) of their area. The strategy was to create a healthy regional economy by organizing many new services, activities, and institutions. For example, the grape growing region along Lake Erie was facing hard times as the large multi-national that purchased area grapes was now sourcing in lower cost regions of the world. In just 2 years, subgroups within the regional network (which crossed state lines) created a new brand, helped local businesses produce new grape products, organized several new festivals, and artists trails, got local businesses to use grape products on their menus, and raised money for a Grape Discovery Center. The national Regional Flavor Strategies Network shared their successes and failures. For example, the Grape Network was able to implement their regional brand very quickly after learning from two of the other groups in the learning network. The other groups toured the grape region and were able to give very useful feedback on local projects. 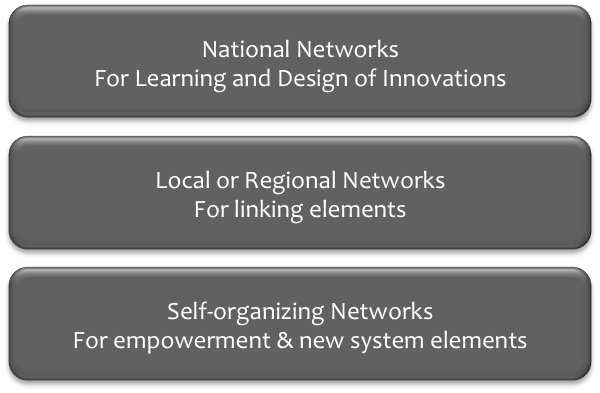 Of course, some networks include advocacy and system development, but I think that all networks would benefit by including both. Do these distinctions work? How would you modify them? Have any great examples? For over 30 years, I have had the privilege of helping leaders around the world develop their leadership effectiveness. In dozens of sectors and markets, I've seen the best and worst. I continue to see established and emerging leaders who are passionate about learning to be better leaders and entrenched leaders who view learning as a threat to their power. In these interesting times, we are witnessing an abundance of leaders who are devastating the integrity of markets and the faith of their constituents. Many countries have what Will Rogers referred to as "the best government money can buy." It is easy to find leaders who define leadership as the exercise of control over money and people. At the same time, the planet is abundant with leaders who are helping to make their communities stronger and more resilient. They have intelligence, wisdom, and transparency. They see themselves more as stewards of resources rather than controllers of money and people. They think that leadership is more about helping people find their power than having power over people. But are these the qualities of good leaders? Perhaps the only thing we can accurately say about leadership is that every assessment is based on personal bias. For some people, good leaders serve their interests at the cost of serving competing interests. They like weak leaders they can control with money, votes or threats to their power and influence. Others like strong leaders who exercise control over others. They like leaders whose rule guarantees certainty in their favor. Whether we want leaders who are children capable of being controlled or parents capable of protecting us, what both perspectives have in common is that they are essentially self-serving. They position leaders as tools to our agendas. And because we are still transitioning through a predominantly adolescent consciousness on this planet, there are almost always competing agendas. In this ethos, we impose on leaders the unfulfillable expectations to guarantee the dominance of our agendas over opposing and hopefully loser agendas. The opposite of viewing leaders as tools to use is viewing them as assets to engage in our networks. The two most valuable assets in networks are knowledge and skills. In this worldview, leaders have unique value to the extent that they have unique knowledge and skills in their networks. Their networks include everyone they directly interact with and influence. Leaders who lack unique value have redundant value in their network. The more connected networks become, the more likely it is that leaders have redundant value. This is one dimension of the leadership crisis today, exacerbated by the fact that the more asset redundant leaders become, the more irrelevant they feel and the more control they exert to restore ego equilibrium. Reality is, in networks leaders can gain unique value in at least two ways. They create unique value when they create a niche of unique value for themselves. And they gain unique value when those in their network intentionally leave them a space of value uniqueness that no one else takes on. This is a huge culture shift to see the value of leaders as equivalent to the uniqueness of their real time knowledge and skills relative to their networks. It is a shift that requires us to question the value of positional power that leaders assume in their leadership roles. Positional power is the assumed power to control money and people. We have abundant and growing evidence that it takes no unique network value to exercise control over money and people. Scope of control has nothing to do with unique value in a network. If scope of control had any causal relationship to scope of unique value in networks, monarchs, autocrats, and dictators would be guaranteed the most unique knowledge and skills in any networks at any levels around the world. Understanding leadership through the lens of unique network value profoundly changes the conversations we have when we interact with leaders in our networks at the relative levels each of us has access to these kinds of interactions. It becomes imperative that everyone understands the unique assets of their leaders. Before they enter any leadership position, we need to gain a collectively clear and accurate picture of their unique and redundant assets relative to our and their networks. When they enter these positions, we need to make it collectively clear what unique assets they have that the thrivancy of our networks require. We also then need to negotiate the areas of asset uniqueness they would provide the network. 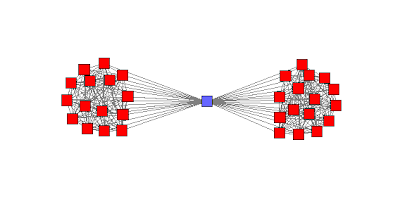 But because of the intrinsically dynamic nature of networks, their relative asset uniqueness and possibilities of uniqueness constantly shifts and changes as other people in the network expand their unique value, making the leader's assets redundant, but still possibly quite valuable. Asset redundancy at optimal levels is key to network resiliency. Networks are also constantly shifting landscapes of opportunities and expectations and so leaders always have opportunities to grow their unique assets to meet these. And this emphasis on asset and network based leadership makes it immediately more possible for leaders across boundaries to collaborate more successfully and intelligently to do together what they cannot possibly do alone, apart or in opposition. This is an incredibly important shift if we seek a world where leaders help build thriving communities at micro to macro levels. In this construct, perhaps the most salient characteristic of network relevant and valued leaders is that they have a passion for knowing their networks and continuously reinvent the unique value in knowledge and skills they bring to their networks. This calls for a profound shift in how we develop, select, and assess our leaders. And the time to begin is now. Node size on the network map reflects a new network metric we are experimenting with called "attention" which tries to determine both quantity and quality of links pointing at someone. It's not just the number of tweets pointed at you, but who they come from that matters. We will also post an interactive version of this map that will allow you to filter on the type of tweets and their timing during the 1 hour session. From: blogbrevity's posterous Thanks, Angela! We continue to have countless conversations with funders and others who want to "grow" networks of collaborations and innovations. This is impossible until they have enough network literacy to understand what it means that a "network" actually "grows." Here are 9 simple indicators of network growth, to this purpose. They become both indicators and strategies for the intentional growth of existing networks. I wonder if a Goldman Sachs executive would spend a night in the house above? After all, they do kind of "own" it. The house, in the Slavic Village neighborhood of Cleveland, had a mortgage that was part of the Goldman Sachs synthetic CDO, ABACUS 2007-AC1. 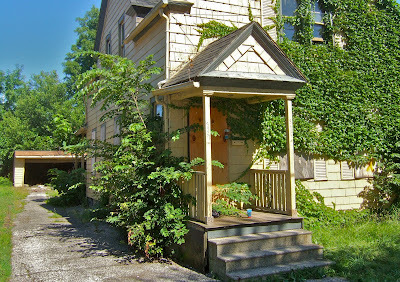 In 2008, the house was foreclosed upon, and still sits abandoned today. At least the ivy devouring the south side of the building seems happy. I am writing this in the Red Chimney restaurant, a social hub for the locals in Slavic Village. This place is probably the only thing that has not changed drastically in the last ten years in this neighborhood. It feels very comfortable -- old networks get rejuvenated here. Every community needs a gathering place, especially in times of trouble. For an in-depth look at the players and financial flows involving this house , see Connecting the Dots of the Mortgage Meltdown. Valdis recently helped CNBC with a documentary about Goldman Sachs and the recent mortgage crisis. What is A Network Weaver? A Network Weaver is someone who is aware of the networks around them and explicitly works to make them healthier (more inclusive, bridging divides). Network Weaversdo this by connecting people strategically where there's potential for mutual benefit, helping people identify their passions, and serving as a catalyst for self-organizing groups. If you at at the NTEN conference, or want to think about what it means to be a conscious Network Weaver at any conference, check out the Google Doc we created to gather what we learn. We are particularly interested in learning what it means to witness others being Network Weavers. How can we notice and support people who are natural Network Weavers? What if we invented an approach to democracy where voting was not a design element in the model. Voting continues to be the root cause of unchallenged excesses, bad decision making, special unethical interests, and leadership incompetence. In most cases, voting is an excuse to avoid conversations that are information-based, inclusive, and innovative. There is no wisdom in crowds of weak networks. Managing assets in the commons can happen in strong networks of people as long as the commons are at the scale of networks where the degrees of connection are relatively close. In these networks, people come together to create commons they manage through conversations that matter. A very different world indeed. We often think of our networks as belonging to us, or our group/team/family. We imagine they have an identifiable beginning and end. We want to draw borders to define "yours" and "mine." Yet, in reality we cannot. We really cannot define where my network stops and yours starts... no matter if you are a person, group, organization, or country. We are all intersected and our connections overlap with those of our network neighbors. Boundaries are fuzzy, at best. Let's look at a simple example. Organizations, whether for-profit, or not-for-profit, usually have a Board of Directors. We can think of this Board as a network that belongs to the organization. All members are linked if they sit on an organization's board together. We might view the Boards of the top 50 U.S. companies like the diagram below -- individual clusters, each belonging to the parent company. The gray links show co-membership ties between the individuals. Directors are not limited to the number of Boards they can be members of. Board members are limited to the number of Boards they sit on only by time, energy and invitation. Below is an example of a Board member who sits on the Board of two organizations. This may be Steve Jobs, who sits on the Board of Apple and Disney. We now choose a different color for those Directors who sit on multiple Boards. We see how the Boards of the top US companies are actually interconnected in the diagram below. Blue nodes are Directors who sit on multiple Boards. The blue nodes in the network above are conduits that move information, ideas, and knowledge between the clusters -- they are at the intersection, where two networks overlap. The blue nodes are well placed to be Network Weavers -- their opportunity to close triangles is great. Contagion of ideas and practices between organizations often happen through flows via their Boards of Directors. 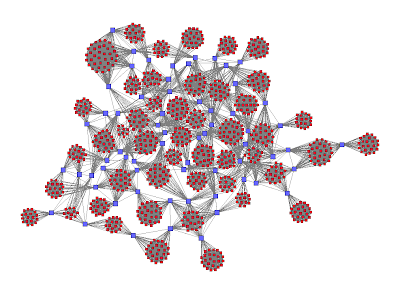 We apply social network analysis [SNA] to this social graph and we see who may be key in this diffusion process. We apply a new SNA metric, called Awareness -- it measures potential awareness of a node to what is happening around it [directly and indirectly] based on it's pattern of connectivity. Those nodes with higher awareness are shown in a larger size in the diagram below. It is usually beneficial to be connected to those who have a good view of what is going on. Information and knowledge is often shared [intentionally or unintentionally] with trusted others, close by. Information leaks and flows, but never too far. Board members who are connected to other highly-aware Board members, have a higher probability of finding out more -- but the range is limited. Even those who just sit on a single Board can increase advantage by being connected to multiple blue boundary spanners. This is reflected in the diagram below. Node size is derived from awareness of what is happening in the network. Some Boards have greater awareness of what is happening in their ecosystem. This was a simple illustration. An actual network between the Board members will be denser, based on their possible multiple ties -- employment, memberships, and other current & past associations. The full multiplexity of the individuals was not known, nor shown. Yet, we see how even some knowledge of a social system increases our potential to target messages to influence that system. Of course, the better our data, the better our targeting. A telescope may be preferred, but even binoculars provide advantage over the naked eye. And binoculars that reveal what is usually invisible, are even more useful! What Board overlaps can you utilize? As networks grow, they grow in confidence. Confidence is the expectation of success and comes from thousands of small acts of success within and across networks. These small acts include solving common problems and problems in common together and sharing learning, knowledge, opportunities, talents and resources together. Every instance of success adds to the network's collective self-confidence that incubates even more collaborations and successes, resulting in "virtuous spirals" of thrivancy and thrivability. And of course, the narrative culture within networks accelerate and scale ripples of confidence throughout the network and beyond to other networks. June, Valdis and I have seen countless networks grow over the past 30 years. 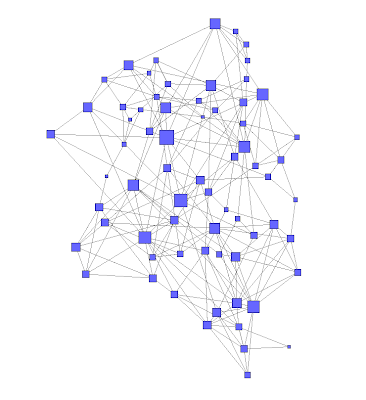 It's interesting to see networks grow from weaker to stronger. They go through four stages in the process. Here is a model based on the phases of human development. When we bring people together in their networks, we see all four stages within various connections in the network. Best of all, unlike human development where phases cannot be skipped, effective network development can involve immediate acceleration to an emerging and scaling network of adult connections. People in the network feel dependent on formal leaders to make things happen in the network. Their whole life is structured around demands that parent leaders take care of all their needs. Their whole thrivancy is based on the trade of compliance for protection. People in the network are interested in making things happen, but only things that require permissions and funding from the parental formal leaders. They are focused in this phase of getting more support from parent-leaders for the things they want to do. They live in continuous demand from a position of entitlement. People in the network give up dependency on their parent-leaders, but still believe the "pie of resources" is still finite and so compete with peers to satisfy their needs. In this phase, people in the network believe that others' loss is the necessary cost of their gain. People in the network take responsibility for their destinies and know that working together expands the pie in ways that allows everyone to thrive. They believe that people in the network can achieve more together than they ever could apart or in opposition. Network weavers help people move into the adult phase more quickly and successfully, accelerating the possibilities of more strong networks. 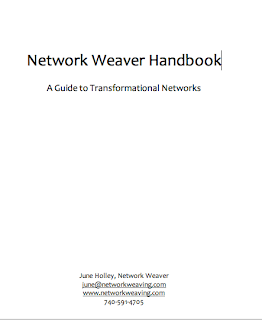 As you may know, I've been working on a Network Weaver Handbook for some time now. I've got almost 100 pages of activities and stories that you will be able to use with your networks, and I think it will end up around 200 pages before I'm through. But right now, I need your help! 1. Which part looks most interesting or exciting to you? 2. What is missing that you would like to see included? 3. What is included that you don't think is that important? 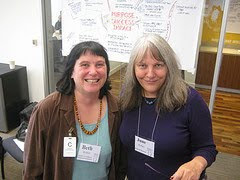 Beth Kanter and I met at a workshop for foundations last fall. She loved the concept of Network Weaving and we decided to spend some time figuring out the synergies between Network Weaving and social media. We decided to use a call line she had but Skype would work as well. 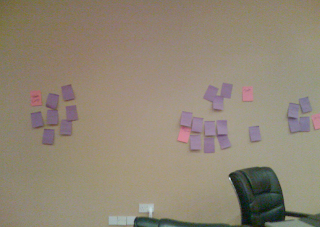 Meanwhile, she set up a little exercise for us to do, which she described on a google doc she set up. I invited a friend. Good thing as Deborah was the only one who did the assignment! Beth then took us to www.flickr.com and showed us how to search the Creative Commons (free to use) pictures there. She was sharing her desktop but letting us make decisions about what pictures to use. It was lots of fun! We noticed the power of slides with only a few words – the image was what had the power to help people get new concepts. I went back and made a new deck, using yarn and knitting images to represent network weaving and feeling a great sense of accomplishment. We invited several addition friends to the next session, and it was great to meet some new people. We got on Slideshare again and Beth talked about how people loved puppies and babies and so we made a deck using images of kids. Beth always had us spend the last half hour reflecting on what we had done. This time we noted the importance of helping people make an emotional connection to concepts to help them better remember and apply them. In the next few sessions, a major shift took place. Someone else helped set up the next time using www.doodle.com. At each meeting, we’d decide what we wanted to learn or talk about. Sometimes we explored new social media: Google Wave, web-based project management, etc Sometimes we had clinics, where one person asked for advice. Sometimes we spent most of the time deeply introducing ourselves to each other. But what ever we did, we laughed a lot, appreciated each other and reflected on what we had learned. After Beth’s initial guidance, there was no designated leader, not even a coordinator: we all took responsibility for making sure the needed tasks got done, we all took notes together (which is possible on google docs), and we took turns facilitating as needed (watching the time, making sure we spent time on reflection). This kind of collaboration can work! I encourage others to start a sandbox of your own. All you do is invite a few friends to a skype call and figure out what you want to learn or do together. Let me know how it works out! 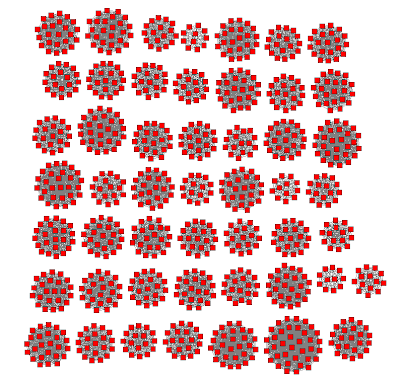 A recent article called Structural Folds: Generative Disruption in Overlapping Groups , by Balazs Vedres and David Stark is chock full of important research on innovation, collaboration and networks. Vedres and Stark studied relationships among businesses in Hungary over the last 20 years. In contrast to Ron Burt’s concept of structural holes, they explore the concept of structural folds. The concept of structural holes describes how individuals who span two different clusters or groups can become powerful by brokering the relationships and information flow across the clusters. Managers who span structural holes often move quickly up the corporate ladder. Using the concept of structural folds, Vedres and Stark argue that moving ideas from one cluster or group to another is not enough to spawn innovation. Groups need to overlap. They need to recombine and do something together to generate innovation that leads to growth. However, this overlap is often disruptive, and can lead to disintegration of the groups. The trick is to move to another level, looking at the whole set of groups as part of a larger network. Then you can see that the larger network has some stability over time – individuals or businesses continue to be part of this larger network, but are recombining with others in different configurations over time. This looks disruptive, but is actually the source of much creativity and growth. The larger network, meanwhile builds a culture of collaboration that encourages and supports even more collaboration. These ideas are very compatible with our Smart Network model. A Smart Network has a core of overlapping clusters. Clusters could be different organizational types (such as entrepreneurs, non-profits and foundations), different geographies, different business sectors, etc. In most Smart Networks, people are recombining through self-organized, collaborative projects. Vedres and Stark remind us that it’s important that these projects contain at least several people who have worked together before, but that including new faces from different clusters is likely to increase the success and growth of the project. How do we get started with self-organization? 1. Have people put their interest or current passion or challenge on a 9 x 12 sheet of paper or PostIt. Have someone sort into Action Groups of 3-10 people. 2. Have each group identify opportunities in that area where something could really make a difference right now. 3. 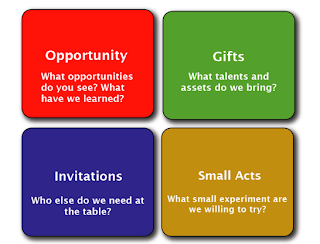 Generate ideas for small projects/small acts that could help the group explore that opportunity. Each act needs a champion. 4. Identify the gifts (skills and resources) that the project team already has to accomplish that act. 5. Figure out who and what else they need to make the project successful and then invite those individuals to join their project. 6. How will the project be managed? Use a project management worksheet or online project management site like TeamworkPM so everyone involved knows what they are to do. Have a volunteer be project coordinator. 7. Check in with and coach the project coordinators. In Appalachian Ohio, a small group of non-profits worked with a regional/community foundation to set up an Innovation Fund called the Yellowroot Fund. This fund had less than $15,000 a year. It provided small seed grants ($500-3000) to small collaborative projects in the region. All projects had to include a mix of both entrepreneurs and support organizations (non-profits, tourism bureaus, local gov't, etc). The first year 15 projects were funded. Most were successful in small ways, but several were very dynamic and successful, and we helped them access larger dollars. Innovation funds encourage people to work collaboratively -- but in small self-managed groups that have a high likelihood of success. Many of the projects linked people across counties. 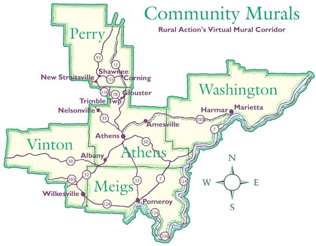 For example, the Mural Corridor Project developed a map showing a trail people could follow to see all of the 17 murals that had been painted on the sides of buildings in small towns throughout 5 counties. Because local businesses were part of the project group, the final map included locations of local businesses such as restaurants and bed & breakfasts – which increased traffic for these small enterprises. The fund only lasted a few years, but by the time it ended many more people in the region knew how to self-organize: come up with a project idea, find others who are interested in working on that project, and make something happen. This fund helped people develop all of the skills described in Jack’s post, below. Local Network Weavers were involved in most of the projects and helped people become more aware of their networks and use them to access the resources they needed. Now, even without those funds, hundreds of small projects are formed every year to develop new trails, festivals, brands, markets and other initiatives. Self-organizing has taken off, and it’s cascading throughout the region.